Long-time readers of my blog might remember a little guy named Clancy. 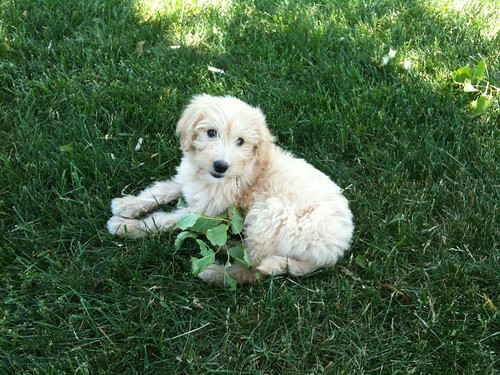 Clancy was a puppy that we got exactly two years ago this month. Some of you have asked on occasion about Clancy and how he's doing. I never did blog about it, but the truth is that we were forced to give Clancy away shortly after he came to live with us. 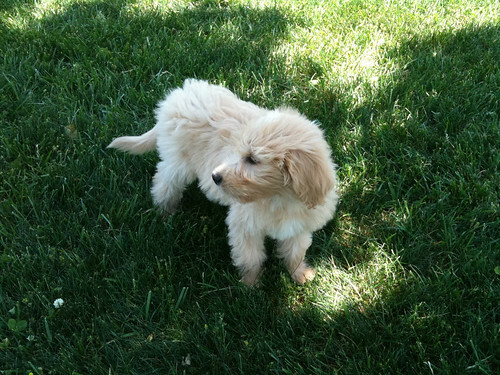 You see, when we decided to get a puppy my wife was a stay-at-home mom, which was the ideal situation for training and raising a brand-new puppy. However, shortly after receiving Clancy, Mrs. Quilt Dad fortuitously received a wonderful opportunity to begin her career as a college-level teacher. All of a sudden a full-time worker again, it became clear that it was unfair to our young puppy to leave him locked up all day long by himself. Luckily, we found an older couple with a big farm that had just lost their dog and were looking for a new puppy to spoil. Trust me, Clancy is a VERY lucky dog. Fast-forward two years, and my wife is transitioning back out of a full-time job to be a student again. With the summer completely off and a much more flexible schedule starting this fall, she and I both felt it was the perfect time to get another dog. Yes, it's Tula ... as in fabric designer extraordinaire, Tula Pink. What started out as a bit of a Twitter joke really caught on -- my wife and kids all LOVE the name. Plus, there may have been a bit of a bribe by Tula Pink herself for some hard-to-find fabric to make a custom dog collar that may have sealed the deal! 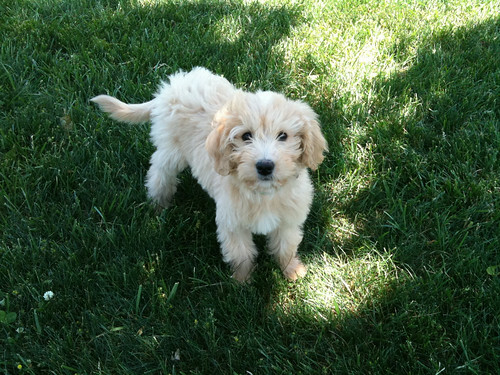 Tula's a golden doodle -- half golden retriever, half poodle -- just like Clancy was. That means no shedding and easy on my allergies. A perfect combination. She's a real sweetheart -- very smart and very well-behaved. But she is a puppy nontheless, which means lots and lots (and lots) of energy, and a whole lot of work. 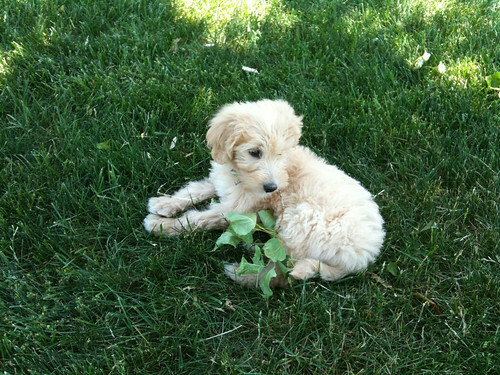 So now there won't just be Tula fabric sightings on my blog ... there will be Tula the puppy sightings as well! "Our corporate brand’s new symbol is derived specifically from a classic “log cabin” quilt pattern, where the core letters of the brand (CNO) neatly come together to form the sum of the parts. The symbol represents our commitment to helping middle-income consumers and retirees protect themselves and their loved ones. Our company and its brand are built on a foundation of honesty and integrity, woven together like a tapestry quilt with the spirit of serving everyday Americans." 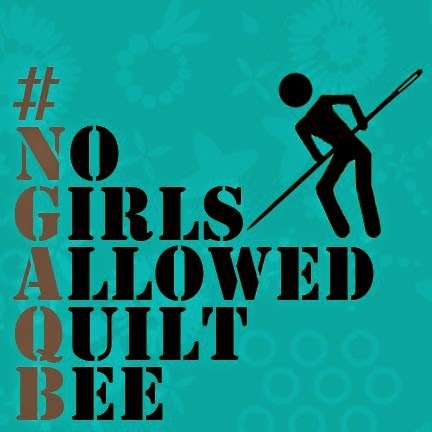 As the "swap swami" of the newly-formed Triangle Modern Quilt Guild, my job is to organize swaps of all kinds to foster community and collaboration among our local quilters. For our first swap, I decided to run a block swap. 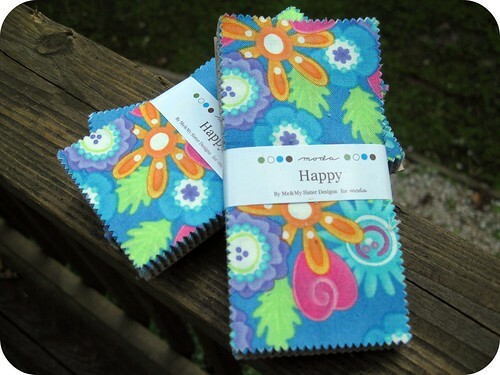 For an entry fee of $4, each swapper got 3 fat quarters of a "mystery line" of modern fabrics ... which turned out to be "Odyssea" by Momo for Moda. By pulling in other prints and colors that they felt complemented the line, swappers then made blocks for 11 of the other swappers based on their stated preferences. Most said "anything goes", but some people asked for wonky stars, crosses, and straight log cabins. Above are the 11 blocks I made for the other swappers. We swapped them at our meeting this past Sunday, and it was fun to see all of the different interpretations of the fabrics, colors, and designs. I also hosted a fat quarter swap during the meeting. Interested members brought in 2 fat quarters wrapped up in plain paper so that the fabric was not evident. For every packet that a swapper brought, he/she could take one away. I think that swap was pretty successful, too. We are toying with some swap ideas for future meetings. For our next block swap, I think people will supply their own fabrics (similar to a virtual quilting bee format). For our next fabric swap, we're considering a "bag o'scraps" swap, where people bring in a gallon-sized Ziploc bag full of their scraps. 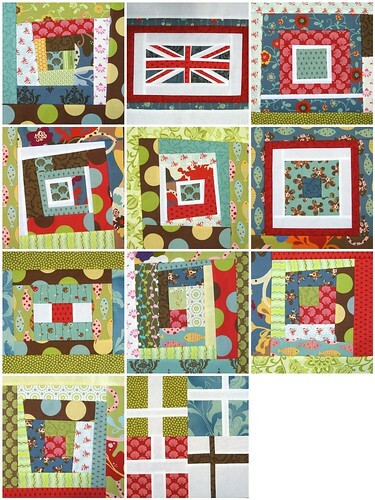 We've also discussed finished goods swaps, including things like mini quilts. Do you have any other fun group activity ideas? What kinds of swaps do your local groups do? Thanks so much for all of the questions you've been posting in the comments of my last post. There are some really good & interesting questions, and I'm getting pretty excited to answer them. Some of the questions were directed at Mrs. Quilt Dad, so she's even agreed to answer some of them. Should be VERY interesting! Be on the lookout for a "20 questions"-type post in the near future. And don't forget that my giveaway is still open for a few more days! One of the most fulfilling things about this whole blogging / Flickr / Moda Bake Shop / Fat Quarterly business is hearing (& seeing) that I've inspired people to make things based on an idea or inspiration that I had. Krista / Poppyprint made this "Flying Fish" table runner using a selection of Japanese fabrics. The pattern was featured in the first issue of Fat Quarterly. Krista selected some beautiful fabrics and took my pattern to the next level by having those diagonal bars end in a triangle of the same fabric, creating some nice movement and unity among the different pieces of the pattern. Thanks, Krista! Love that pieced back! Nice job, Beth. 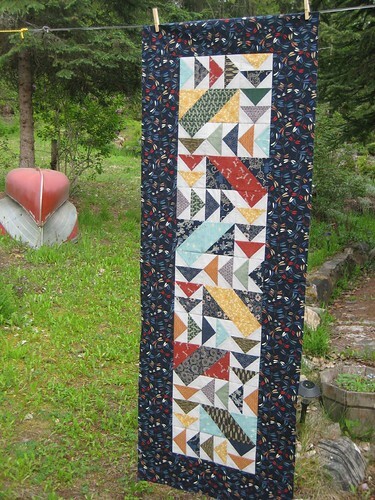 Here's another Off the Grid quilt made by Betsy. Betsy useed another of my favorite new fabric lines, Botany. How cool is this? Betsy made a pillow to coordinate with her quilt. What a great idea! Betsy, if you ever get tired of this set, just let me know and I'd be happy to take it off of your hands. It will have a happy home here ... I promise! 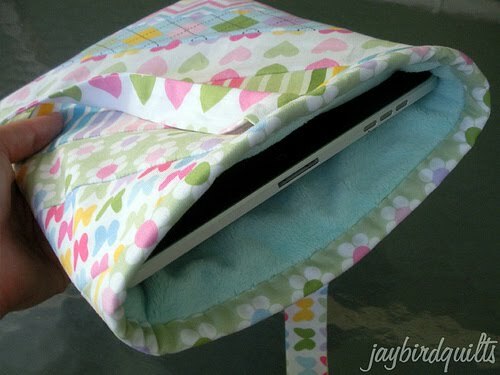 One of my more recent tutorials was for an iPad sleeve, which was also featured on the Moda Bake Shop. I wasn't quite sure how well this one would be received, since relatively few people have iPads ... and I figured that those that do would be getting some cool leather portfolio or something. I was so happy to hear that at least two people have used my tutorial ... and gave me some good feedback on it, too. 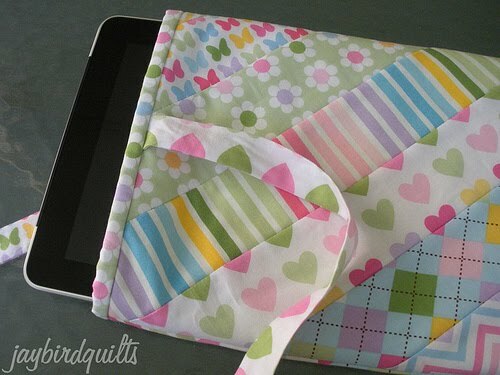 This first one was made by Julie (aka jaybirdquilts) for her mom. 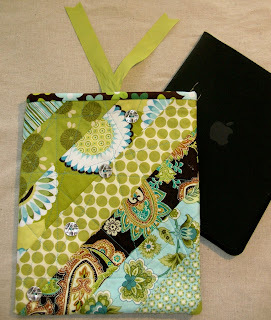 She used the Remix line by Ann Kelle for Robert Kaufman for the exterior and Moda Snuggles fabric for the interior. Isn't it great? Thanks, as always, for all of the great feedback on my different patterns. I'm working on another quilt pattern right now for our 2nd issue of Fat Quarterly (coming this July), and have a few other things rattling around in my head ... so stay tuned! When I decided to go to the International Quilt Market last month, I had the best of intentions. 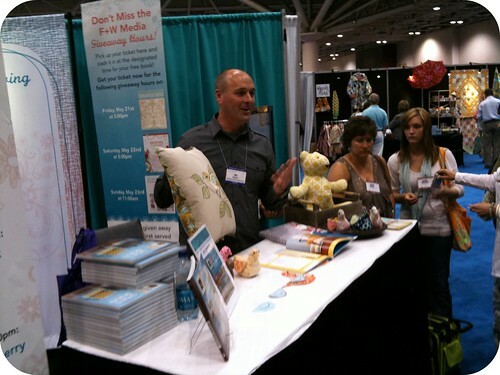 My initial plan was to blog from the show floor. Doesn't that sound cool? Cool, yes ... but realistic? Not so much. So when that didn't really work out for me, I decided I would blog each evening about the day's events. Yeah, that didn't happen either. Then, when my flight home from the MSP airport was delayed and I had a few hours to spare, I thought it was the perfect time to pony up the $6.95 for unlimited wifi and blog, blog, blog. But I uploaded my market photos to Flickr and caught up on LOST instead. And when I stepped off the plane at RDU, I was almost immediately gobbled up by real life again. Work, family, kids, the sale of my house completely falling apart before my eyes (grumble, grumble) ... well, you get the idea. 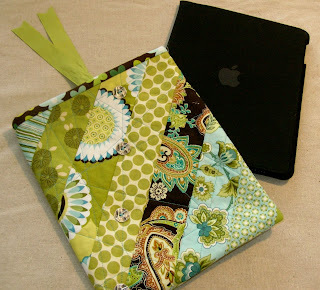 So here I sit, almost 3 weeks later, writing my Quilt Market blog post. Bad, bad blogger. By now I am sure you've seen everyone else's pictures and read everyone else's recaps. To be frank, I am not sure I'll be able to bring very much to the table that you haven't seen before. But I have several other blog posts queued up in my drafts folder, so this post is the only thing standing in the way of "getting on with it". Oh, but I do have prizes. So that's a good thing! 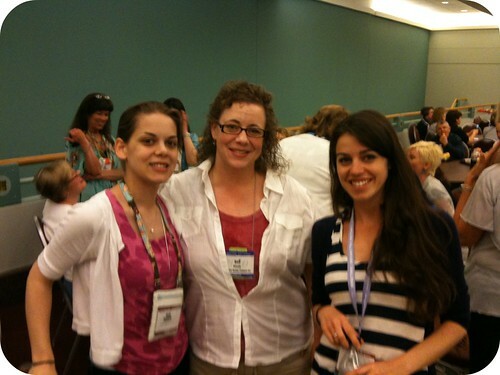 Let me start by sharing one of the highlights of my whole quilt market experience: meeting Amy Butler. You can go all the way back to my first post and see that Amy Butler (and, of course, her beautiful fabrics) played a big role in getting me into quilting in the first place. Very early on the first day of market I walked right by Amy's booth. She was speaking with someone and I didn't want to seem like a geeky uber-fan, so I kept on walking. As soon as I got past I stopped myself and thought, "this is exactly why I came -- to take advantage of opportunities like this." So I turned myself around and walked back to Amy's booth. At this point Amy was all alone in the booth, straightening up some displays, so I stepped right up and introduced myself. 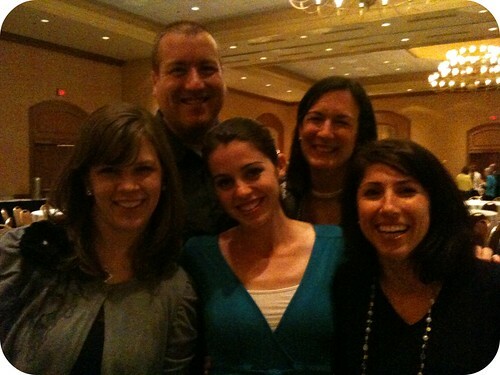 Amy was as warm and kind and gracious and friendly as everyone has always described her to be. I told her all about how she inspired me to start sewing and quilting (probably babbling on and on incoherently). Amy's new fabrics (Soul Blossoms) and patterns and books and wallpaper and yarn were all on display, and were just as amazing as you would expect them to be. PS. Yes, Amy is tall, but I'm over 6'4" myself so it was no big deal! I snapped the following picture for Amanda (aka mrsmcporkchop). 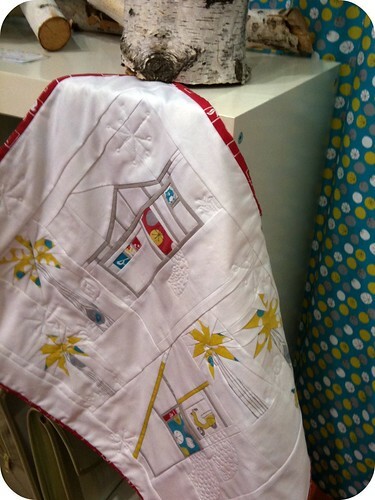 It's the mini quilt that she made from Circa 50 fabrics that was on display in the beautiful Birch Fabrics booth. Unfortunately, she was unable to make it to Minneapolis to see it in person. I was, however, able to meet the lovely Cynthia from both fabricworm and Birch Fabrics at market as well. The Birch fabrics are gorgeous and I see nothing but great things in store for Cynthia & her new fabric venture. On a separate note, I received my bundle of Circa 50 that I won in Cynthia's giveaway last fall ... so stay tuned, because I probably won't be able to resist cutting into it for long! 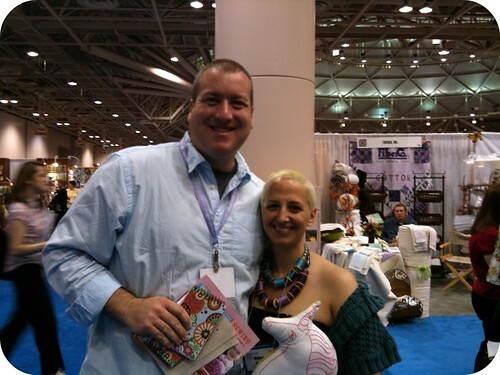 Let me introduce you to one of my bestest market buddies and bloggy / Twitter pal Jennifer. 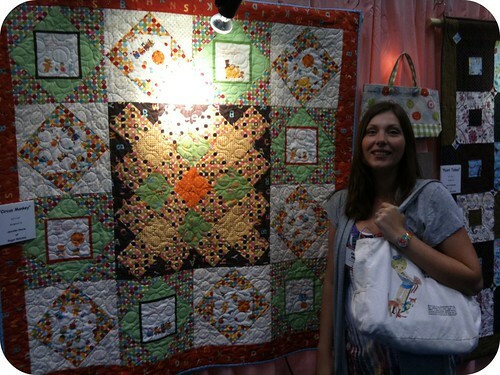 Here she is in front of the quilt she designed that was on display in the Lecien booth. It's made from the sticky sweet Caramel Town line of fabrics. 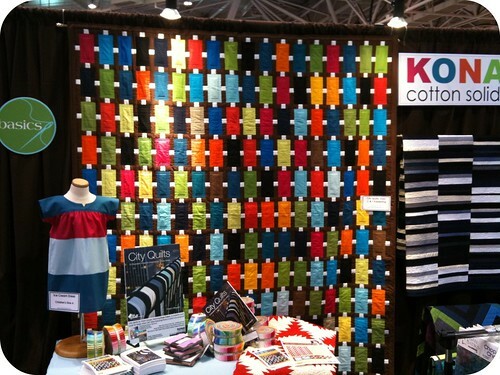 I had to take a photo of this stunning quilt that was on display in the Robert Kaufman / Kona solids booth. It was made by Cherri House, another one of my quilting idols whose blog I've been reading practically since day 1 of my quilting adventure. I've always admired Cherri's simple yet bold & innovative designs, and her inspiring use of solids. I was lucky enough to meet Cherri at market as well, where she was celebrating the release of her new book, City Quilts. I've had a chance to see the book and, let me tell you, it's one of the best quilting books I've seen in a LONG time. I'd put it up there with the Kerr/Ringle books, which I hold in the highest regard. This quilt is one of the patterns included in the book. One of the most fun people at market? Sandy Klop of American Jane, for sure. Not even 5 minutes after being introduced to Sandy (thanks, Julie! ), we were sharing picture of our kids (me) and grandkids (her). Sandy's just that type of person: real, genuine, sweet, and full of laughs and smiles. She was showing off her new line for Moda, Punctuation, which I can't wait to get my hands on. Even if you haven't read all of my posts, you don't have to look much further than my blog header to know that I am a HUGE fan of Joel Dewberry. Along with Amy Butler, his fabrics really kick-started my interest in designer fabrics ... and, well, it's been downhill ever since. I was extremely fortunate to meet Joel and chat not once, but a few times with him. Joel was a really warm, soft-spoken guy, and it was fascinating to learn that, apart from sharing a passion for creating and handmade items, we actually work in very similar fields. Besides being an amazing designer, Joel is -- quite simply -- a super nice guy. I am a fan for life. In case it hasn't come through loud & clear thus far, I had a BLAST in Minneapolis. The parties, of course, played a big role in increasing the "fun factor" of the event. The biggest bash was the Moda Fabrics party, where I got to mingle with many of my favorite designers, bloggers, and other industry folks. Here's a picture of me with some of the coolest girls in the room: my favorite new designer Kate Spain (I currently have both Verna and Fandango projects in the works! ), Vanessa of V and Co., Angela (Moda Home Mome blogger and head Moda Bake Shop chef extraordinaire), and another of my bestest market buds, Kaye of Miss Print. 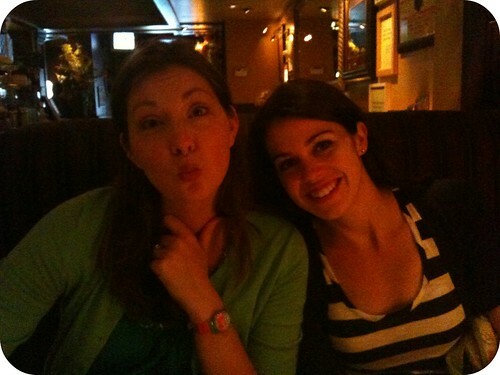 Speaking of cool girls, they just don't come much cooler than Melissa Averinos and her PIC (partner-in-crime) Beth Dunn. I've been a big fan of them for a while now and have been semi-stalking both on Twitter since I joined a few months back. I am fairly certain they didn't know I existed before market, but I am so happy that we were introduced. 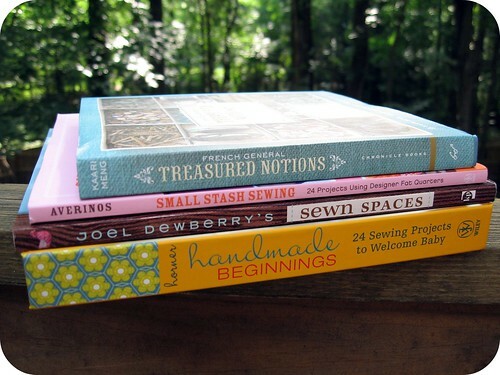 I love Melissa's new book, Small Stash Sewing, and can't wait to see what she has in store for us with her upcoming new fabric line. Heck, she even convinced me to pick up the BBC version of Jane Eyre. Haven't watched it yet, but I was an English major, y'know! Here's Kaye again (on the right) with two more of my bestest market pals. There on the left is the omnipresent Julie (aka jaybirdquilts). 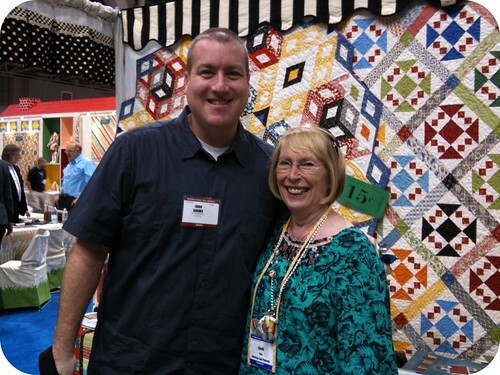 I cannot thank Julie enough for being my trusty guide through my first quilt market. It was Julie & Rachel that originally convinced me to book my ticket to Minneapolis,and Julie really took care of me as I learned my way around and introduced me to so many people. Thanks, Julie! The night before I left Minneapolis, I had dinner with Jennifer & Kaye at an awesome burger place called Ike's (highly recommended if you're visiting the area. Thanks for the recommendation, Angela!) By this point, Jennifer, Kaye and I had gotten pretty tight -- tight enough, anyway, that I allowed Jennifer to call me "Q Daddy". They were awesome market floor friends -- we walked much of the show together each day. 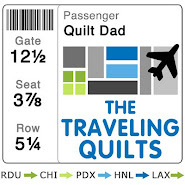 Jennifer has even indicated that she is designing some "Quilt Dad is my Homeboy" t-shirts -- let her know if you want to place a pre-order -- and I had come to calling them my "Fly Girls". Too funny. After dinner, the three of us trekked to the Mall of America. I just couldn't leave Minneapolis without experiencing it. Finally, I wanted to show some of the books I was able to get at market. Each of these is actually autographed by the authors themselves! Pretty rad, huh? 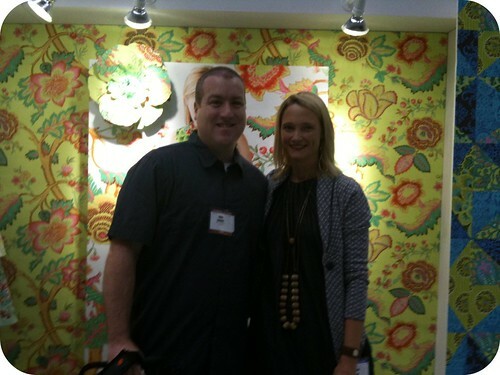 In closing, quilt market was an AMAZING experience and exceeded all of my expectations. I am just so, so happy that I took Rachel & Julie's advice, took the plunge, and jumped right in. Everyone I met in Minneapolis was, quite simply, wonderful: Lissa and Scott and Violet and Valori and Kim and Lizzie and Joanna and Susanne and Pam and Monica and Anna Maria and Doe and Cyndi and Erin and Cara and Vickie and Stefanie and the whole gang from the Fat Quarter Shop. And I'm sure I'm missing many others. Thanks to all of you for helping to make my visit a memorable one. I really felt at home among all of these people. I am not sure if circumstances (job, family, finances, etc. etc.) will allow me to go to Houston in the fall, but I am sure going to try my hardest to be there. 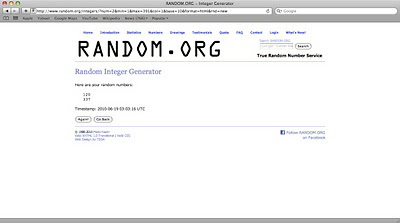 OK, and now for the giveaways. Have you guys heard about the newest addition to Moda's line of pre-cut fabrics? These little guys are called "candy bars", and measure 2.5" x 5". 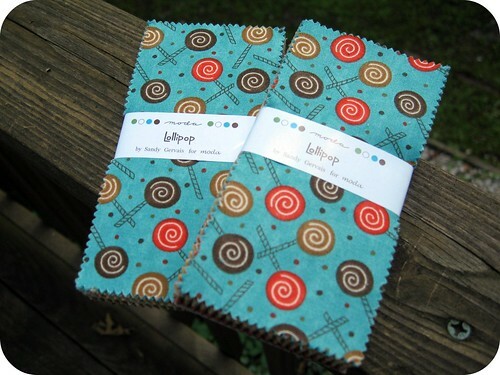 Kind of like if a charm pack and a jelly roll had a baby. 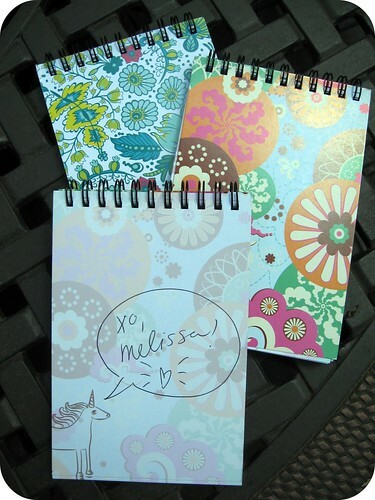 Both winners will also be getting one of these cool little notepads with fabric designs on the cover. The one on the left is from Anna Maria Horner, and the one on the right is from Melissa Averinos. Melissa signed the one in the front, but I'll be keeping that one! Sound good? If you want some candy bars, just leave me a comment below. Ask me a question -- anything you want to know about me. (Keep it clean, folks!) I'll try to answer some of the better questions in a future post. 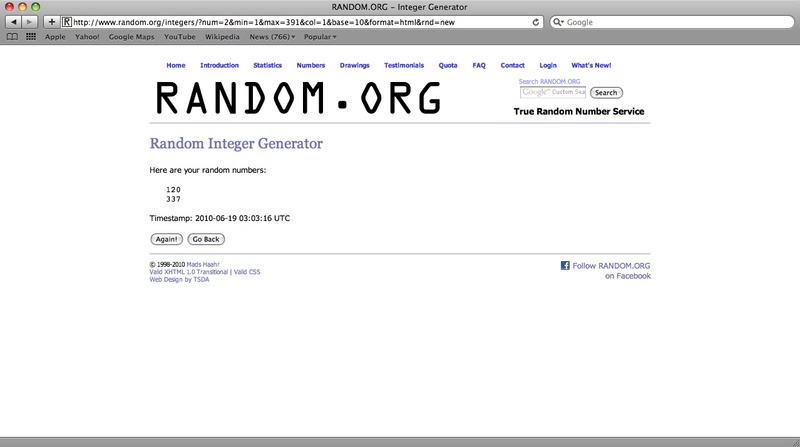 I'll leave the contest open until next Friday, June 18th, when I will randomly pick two winners. Note: this giveaway is now over and comments are closed.